Can Rio's Crime Problem Be Solved Before the Olympics? A massive blackout that plunged huge swaths of Brazil into darkness  as well as the whole of Paraguay  underscores the challenges facing South America's biggest nation as it prepares to modernize its infrastructure in time for the World Cup in 2014 and the Olympic Games in Rio two years after. Tuesday night's blackout brought chaos to some of the region's biggest cities and frightened many of its residents. It started at around 10 p.m., when lights flickered for a few moments and then died. It lasted more than two hours. Power returned to São Paulo, a metropolis of more than 20 million people, around midnight, before going off again a few moments later. Lights came back on shortly before 1:30 a.m. The power outage affected 18 of Brazil's 27 states and caused havoc, with metros in at least two cities grinding to a halt and blank traffic lights causing road chaos. People got stuck in elevators. Universities sent students home. Bars and restaurants couldn't serve food and drink. The water supply was affected in some areas, and cell-phone calls weren't going through. Furthermore, Brazil is a nation where high crime rates have bred fear and suspicion, and so huge numbers of people stayed home, keeping their distance from the sinister, unlit streets. "I was terrified. I've never seen anything like it," says Claudia Lima, a shop assistant who was at home when the power went out. "Where I live you can be assaulted at 8 o'clock in the morning  imagine at night with no light. There is this fear not of the dark but of not knowing what is going on. Everyone I know felt the same way. We felt impotent." But in many ways, the blackout should have been no surprise. Localized blackouts on city blocks are not uncommon and even major incidents are not unheard of. 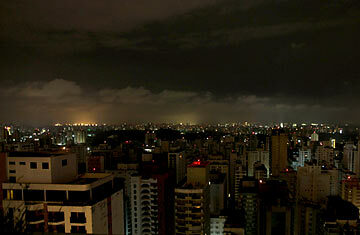 A similar four-hour outage in 1999 left 60 million Brazilians in the dark. Computer hackers caused blackouts in parts of Espirito Santo and Rio de Janeiro states in 2005 and 2007, according to a recent and unconfirmed claim by CBS's 60 Minutes. The exact cause of Tuesday's outage is not yet known, but officials and news reports point to problems originating at the Itaipu dam, the huge hydroelectric plant on Brazil's border with Paraguay. "The most probable hypothesis is there was some accident that affected one or more points in the transmission system," a statement from Itaipu said. The area suffered unusually fierce storms on Tuesday, which could have played a part. What is certain is that Brazil faces huge infrastructure challenges in the coming years. The government of Luiz Inácio Lula da Silva has promised to spend $14 billion preparing for the Olympics and billions more readying for the World Cup. But until now, the priorities were improving atrocious transport systems, providing adequate hotel accommodations and stemming the violence that makes Brazil one of the homicide capitals of the world. Experts believe the blackout was an isolated incident rather than a deep-seated defect. It nevertheless puts a spotlight on another issue surrounding Brazilian readiness for the global centerstage. It dents the government's pride in an area in which it has justifiably claimed to be a world leader. Brazil gets about 92% of its energy from hydroelectric sources, an unusually high percentage and one that is natural, renewable and non-polluting. The blackout will not alter that. Brazil has enough gas- and oil-fueled plants to serve as back-ups in case of drought, and it will add another 20,000 MW of capacity by 2014, according to Rafael Schechtman, director of the Brazilian Centre for Infrastructure. What it will have to do is better manage the energy it has. There was no need for so much of the populous southern and central Brazil to be taking energy from Itaipu at the same time, Schechtman says. "The whole point of the grid system is to provide balance so that all the weight is not hanging from one line," he says. "If you have lots of lines and one breaks, the others pick up the strain. What I want to hear from the government is why so much pressure was on Itaipu." He is not the only one. The government has a lot of explaining to do. And a lot more work needs to be done. See pictures of Olympic highs and lows. See how to plan for retirement at any age.